Saturday night was an East Brunswick sort of a night. Before Miss B's birthday drinks at Mr Wilkinson, CD and I had dinner together at Bar Idda. 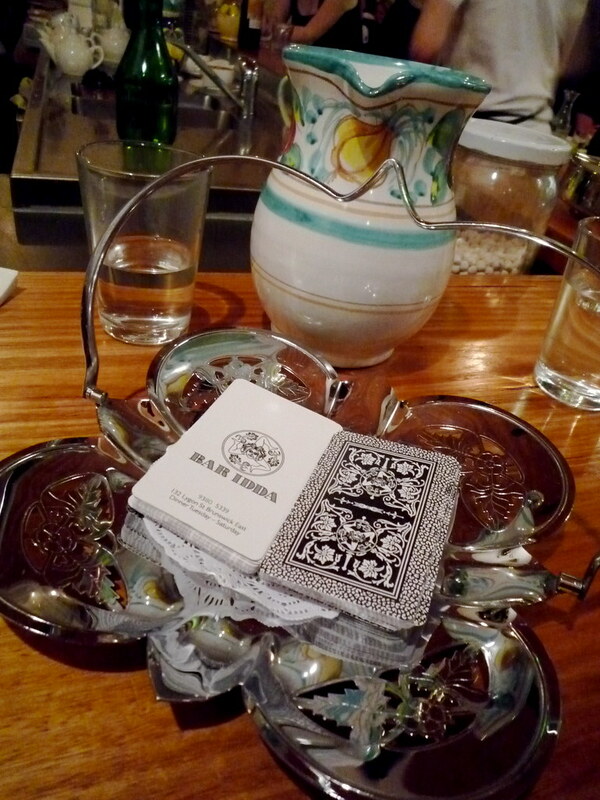 Love their business cards that look like Italian playing cards, and the ultra-gaudy plastic covers on the outside tables. 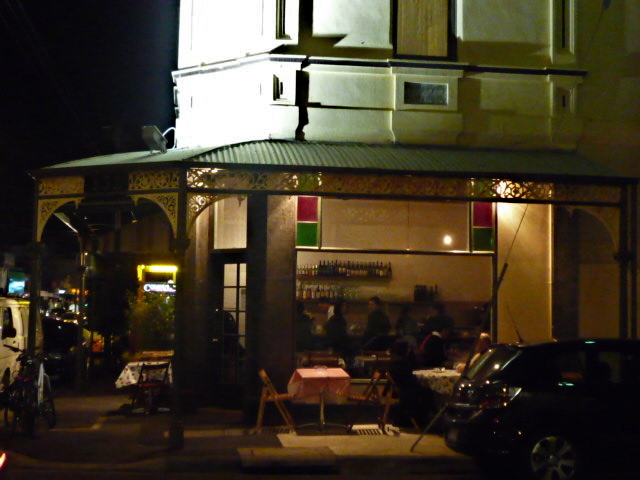 I'd never been to Bar Idda before: last time I'd visited 132 Lygon Street was in 2007 when it was Rumi, before Rumi moved a few doors down the road. The red and green stained glass windows remain, but the restaurant is now Sicilian. Given my Friuli-Venezia Giulian heritage (and Nonna's cooking), I'm much more familiar with northern Italian food, but I've become increasingly fond of southern Italian food and its Moorish, moreish flavours in the last few years. After all, what's not to love about saffron, cinnamon, mint and chilli, eh? CD and I perched up at the bar and decided to share a series of rustic dishes. 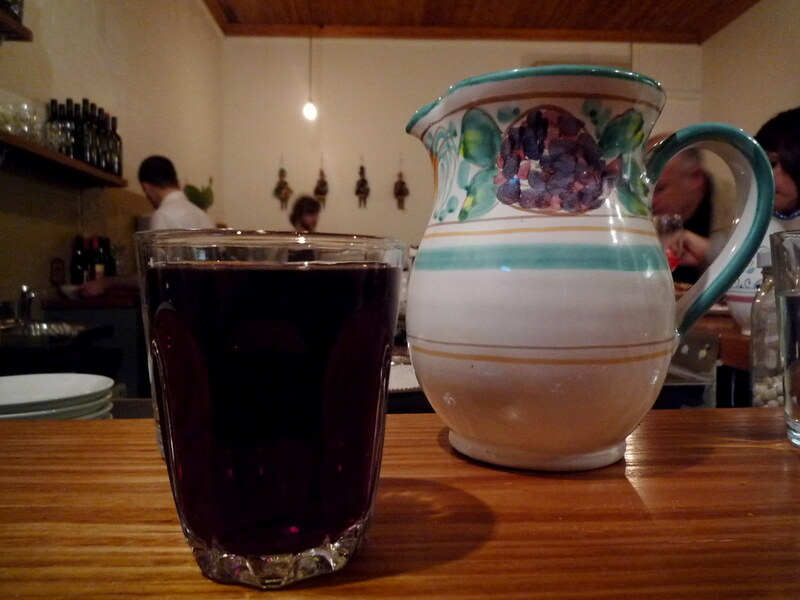 The red we drank was the 2007 Donnafugata 'Sedara' Nero d'Avola ($9/$43), made from an indigenous Sicilian grape varietal, served in a simple glass tumbler. 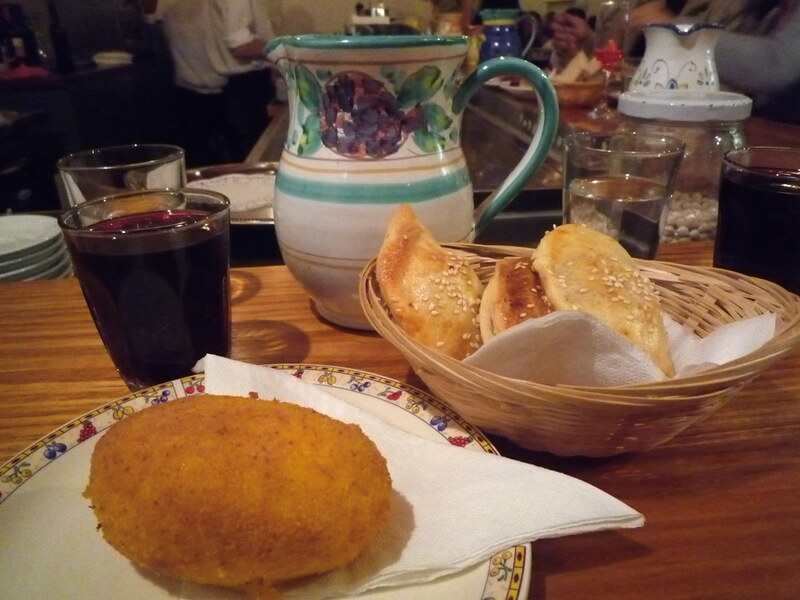 We started with the suppli (a saffron rice croquette stuffed with three Sicilian style cheeses, $6.50) and the impanati di Messina (little pastries filled with roast chicken and Bar Idda's pork sausage, $10.50). The pastry on the impanati was a little on the thick and chewy side for my liking but the filling was good, as were the cheeses oozing out of the middle of the suppli. 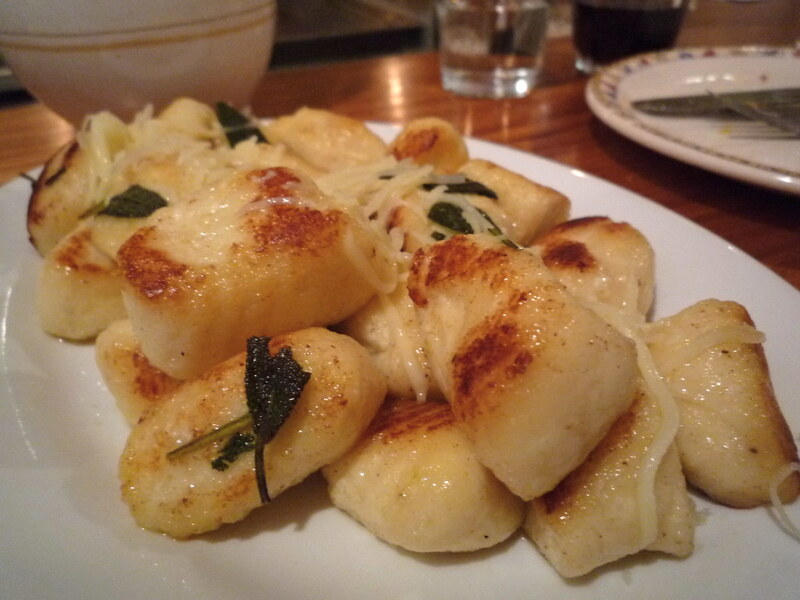 We were impressed with the plate of gnocchi we shared: fat, fluffy pillows made with ricotta and a hint of lemon, fried with sage butter and served with caciocavallo ($15). 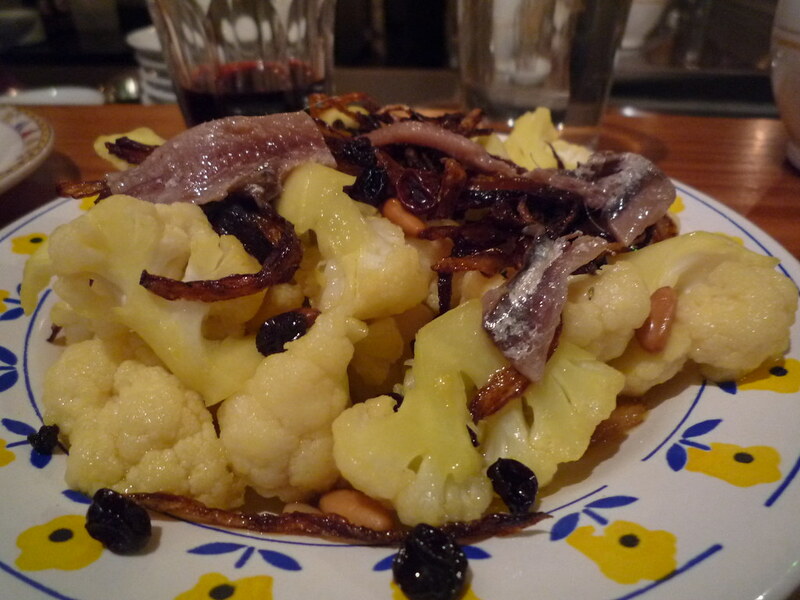 We also had the saffron cauliflower with fried currants, pinenuts, onion and anchovies ($9.50) and the cucuzza (preserved pumpkin with cinnamon and mint, $8.50). The cauliflower was a little light on the saffron (and very similar, come to think of it, to the cauliflower I had last time at Rumi) but the anchovies were a great touch. And we really loved the generous serve of cucuzza (which we ended up sharing with the charming Jason who was dining with a lady friend at the other end of the bench). 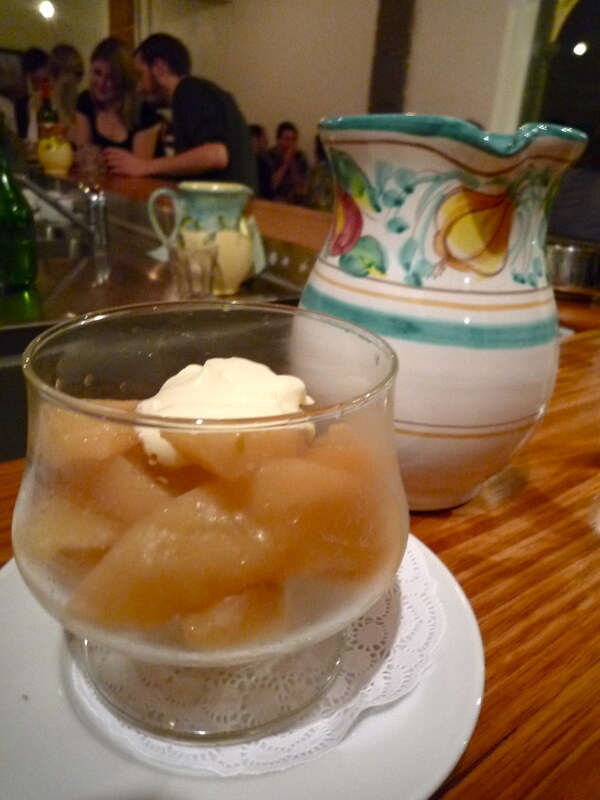 To finish we ordered poached quinces, washed down with a sip of Jason's grappa di zibbibo. As those who put up with my yammering on Twitter are aware, I am ALL about the poached quinces at the moment: conveniently, last week's Good Weekend featured an Andrew McConnell poached quince recipe, which I slavishly recreated last Saturday to pleasing effect. 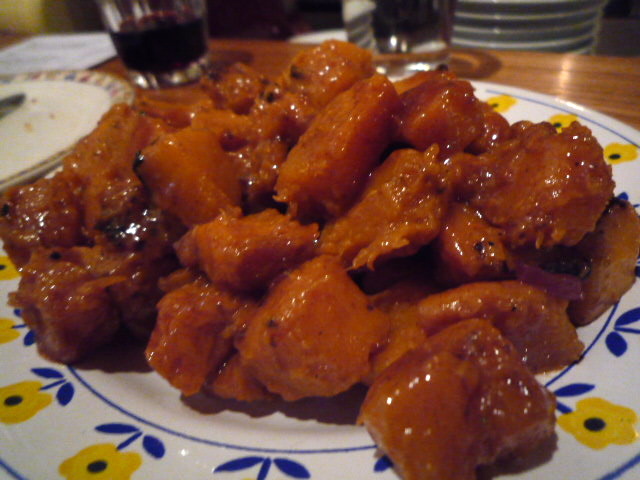 The poached quinces at Bar Idda didn't have the same gorgeous dusky red tinge that mine and A.Mac's had, but they were nicely delicate in flavour. 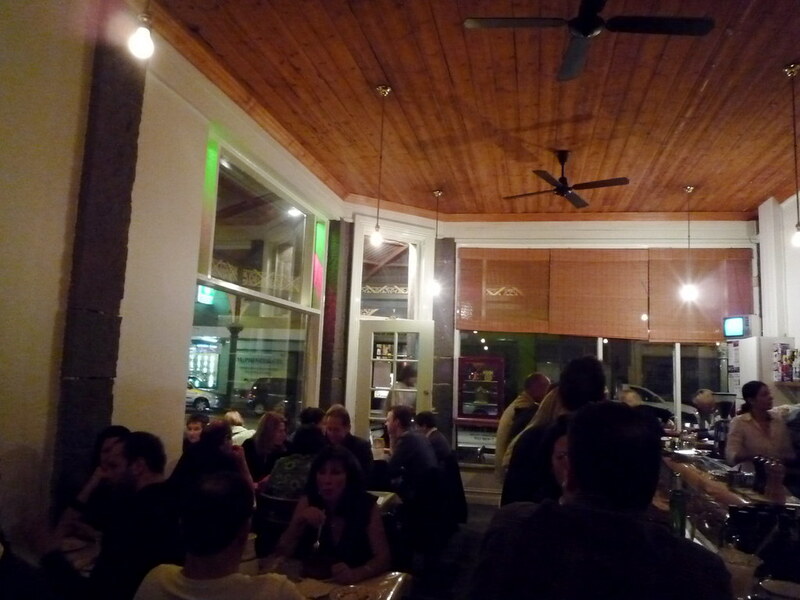 As was the case when the restaurant was Rumi, if there isn't a spare seat then you can go for drinks next door at The Alderman and order items from Bar Idda to eat in there. Win! YES. This place is so high on my list. Food looks great! It looked like something my Mom would make. And the place too. It has a homey feel to it or I probably can't see it very well...needs more lighting. The quinces look heavenly! I don't mind that it's a little on the pinkish side. Yeah, the lighting there was pretty dark, Megan. Might make me enjoy sandwiches. Will only break the dislike next time I'm in Melbourne, though. Hey Claire, I was looking for an Italian restaurant near the city of Melbourne except Richmond as I found the greatest one in East Richmond. 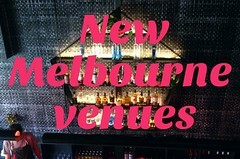 It's great to see your post introducing one in East Brunswick as I'm living in the city and keen to explore close suburbia of the city of Melbourne. 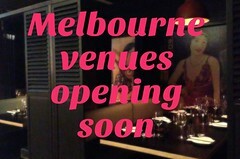 In addition, if you are keen, it could be a good choice to give it a go to The Sicilian on Swan St. It's near corner Church St. but I couldn't remember the exact address, sorry... However, the place was a fair bit casual, easy, convenient, as there were not that many people to visit... (Sorry for the related people:>) They accept extreme range of gluten free and vegetarian meals though they were not shown on the menu originally. Yes, they are quite easy-going. I thought it's not enough that The Sicilian is the best of my choice for the Italian restaurants in Melbourne so I wanted to try more restaurants which are not that far from the city but I couldn't find something's worth trying... Then I found your blog:) I should give it a go. Thanks a lot!